Chilli Gold is a slot that exists of four rows instead of three. However, don’t let this scare you off, as the slot is actually kept rather simple. The nine up until the ace have been used to fill the slot, and other than these standard symbols you’ll find mostly chilli symbols. 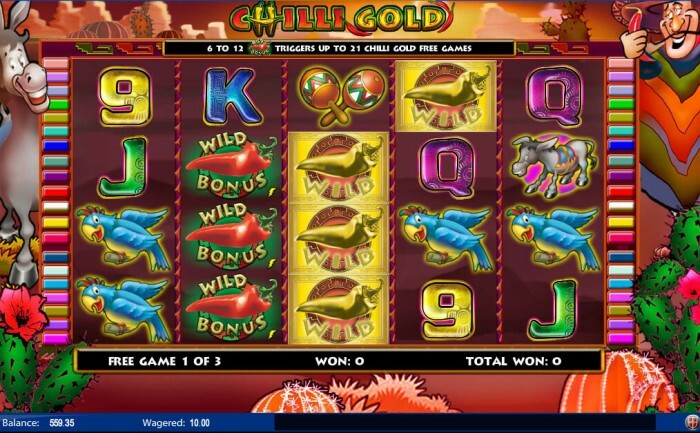 The chilli isn’t just the wild in this slot, but it’s also the scatter. You’ll see this symbol is piled on the wheels. That’s just as well, as you need at least six to reach the bonus. All other animations are to do with Mexico, and it’s advisatory to turn on the music when playing this slot. The music doesn’t just enhance the game experience, it’s also a lot of fun. To reach the free spins in the Chilli Gold slot, you need the scatter. However, you need the scatter six times, instead of the regular three. When you reach the free spins, you’ll receive three. To make a larger profit, you need more scatter symbols. If you get seven scatter symbols, you will receive six free spins, and per additional scatter you receive three more free spins. The maximum is 21 free spins with 12 scatters on your turning wheels. When you play with free spins, an extra wild symbol shows up, and suddenly the name of the game makes sense. Namely, the golden chili shows up! This golden chili will help you enlarge your winnings without additional wagers. Please pay attention to the fact that you can actually win free spins while using free spins. However, this does not happen too often, as you would need the scatter six more times. Furthermore, because you have many scatter symbols leading to high gains, winning more free spins becomes even harder. Even though it won’t happen very frequently, it is good to know. According to its paytable, Chilli Gold has 38 pay lines. However, if you would actually take the time to count them, you would end up with 40 of them. The most likely explanation is that Amaya forgot to mention the remaining two in the pay table. Pay lines cannot be altered: not even before and not during the game. However, you can alter the height of your wagers by lowering the value of the credits, in the bottom left corner. Additionally, you can alter the amount of credits wagered, also in that same corner of your screen. The slot does have autospin, but will not turn off for free spins. Therefore, we advise you to stay focused on the game for the entire duration of the game. 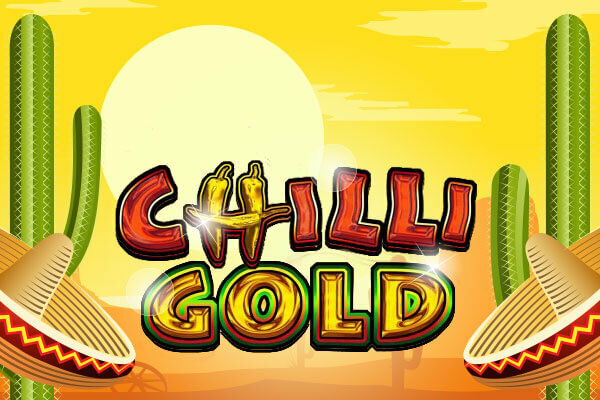 You can play Chilli Gold for free to practice, but do bear in mind that you will not be able to receive all of your winnings in playing money!